Could Obama Swing the Israeli Election? President Obama sees Israeli Prime Minister Benjamin Netanyahu as obstructing his pursuit of legacy-defining foreign policy achievements in the Middle East. This is the first time since 2009 that the Obama Administration may think it has a credible opportunity to replace Benjamin Netanyahu with an Israeli government prepared to make more concessions to the Palestinians. The idea that Obama could have a more compliant partner in Jerusalem for the final eighteen months of his presidency has to excite his closest aides as they reach for achievements to crown the President's legacy. This new perception, that Netanyahu can be toppled, has emerged suddenly as the subject of audible whispers in Europe as well as Washington. From 2009 through 2013, innumerable polls of Israeli opinion failed to identify anyone in a position to compete with Netanyahu for the role of Prime Minister. Even in 2014, every poll taken until this month found the left in a distant second position to the coalition headed by the Likud. But since the Knesset was dissolved on December 8, and especially since Labor leader Isaac Herzog merged his center-left party with Tzipi Livni's Hatnua, the polls have shifted significantly. In thirteen of the nineteen Israeli polls taken since December 8, Herzog's Labor surpasses Netanyahu's Likud in projected Knesset seats, and in another four polls Labor and Likud are tied. The perception that Netanyahu can be toppled has emerged suddenly as the subject of audible whispers in Europe as well as Washington. Equally important, there are now for the first time several credible scenarios in which the "Peace Camp" led by Labor could assemble a winning coalition. Unlike 2009, when Kadima's Livni won the most seats but was unable to form a government, Labor/Hatnua and its natural allies -- Meretz, Lapid's Yesh Atid, and the Arab parties (the latter probably supporting from outside the government) -- could achieve a majority by winning support from two or three potential "swing" parties whose leaders -- Moshe Kahlon, Avigdor Lieberman, and Aryeh Deri -- have each signaled openness to the idea. Netanyahu is newly vulnerable; many Israelis express fatigue with him after six years, as Americans do with Obama. There is a craving for new leaders, a demand for a new economic agenda, and a majority wanting greater fairness on social issues. Israelis seem to be looking around to see if someone else could do a better job. However, the left has its own vulnerability, especially on the issue of the Palestinians. Most Israelis do not think the rise of Hamas, Hezbollah and ISIS makes this a great time to sign an agreement requiring the IDF to leave the West Bank. They followed Ariel Sharon when he pulled every soldier and every settler out of Gaza in 2005, but what happened after that withdrawal was the opposite of "land for peace." Disengagement in 2005 brought, not peace, but the election of Hamas in 2006; a coup in Gaza in 2007; three wars in Gaza in 2008-9, 2012, and 2013; 10,000 rockets and missiles where before there were none; tunnels to infiltrate Israeli communities; and lots more. Moreover, what Israelis see today when they look out the window is violent upheavals all over the Middle East. It does not inspire confidence that just signing a piece of paper will bring real peace. So criticizing Netanyahu for being tough on the Palestinian question could be counterproductive. But where, some argue, Netanyahu may be more vulnerable, is by feeding the belief that he has strained relations with Israel's traditional allies in the United States and Europe. Advocates of American pressure on Israel often cite the example of how sharp words expressed against Israeli Prime Minister Yitzak Shamir in 1991 by President George H.W. Bush and Secretary of State James Baker, contributed to Rabin's great victory over Shamir's Likud in Israeli elections the following year, leading to the Oslo negotiations and the questionable Clinton peace process. The theory that friction will weaken Netanyahu is unproven. If Obama decides to pick a fight with Netanyahu to influence the Israeli election, it could be focused on their personal relations. Even if the occasion is Iran sanctions legislation, pending in the Senate, or some housing units in Jewish areas of Jerusalem, the tactic may be aimed at personality rather than policy. Kerry told European diplomats that Livni had warned him against using the Palestinian UN resolution as a point of pressure, as it could backfire and strengthen Netanyahu. We will see whether this advice ended the temptation for Obama to intervene. Or did it merely redirect the tactic to another place where Obama sees an opportunity? Obama could pay a price for provoking another confrontation with Bibi. His own credibility is tarnished, particularly in foreign policy. He faces a Republican Congress that is unlikely to go along. The theory that friction will weaken Netanyahu is unproven; the reverse could happen. 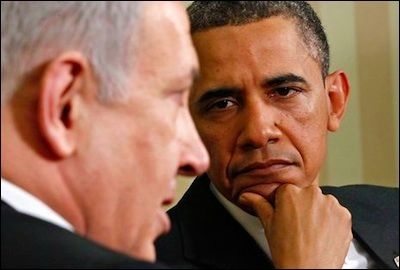 And Netanyahu may well win the Israeli election on March17, so Obama needs to think about the morning after. Still, for those in the President's circle who believe that a peace agreement between Israelis and Palestinians would fall into place if only Bibi did not stand in the way, there has to be an enormous temptation to seize the opportunity. There are, no doubt, some in the Israeli peace camp who will encourage this line of thinking about American pressure.